Site Age: No confirm date. What you will see here: Cenotaphs, Chhatris, Sunrise & Sunsets. If you think cremation grounds are the most boring of places, you should go to Vyas Chhatri in Jaisalmer, and see the grandeur of its memorials. 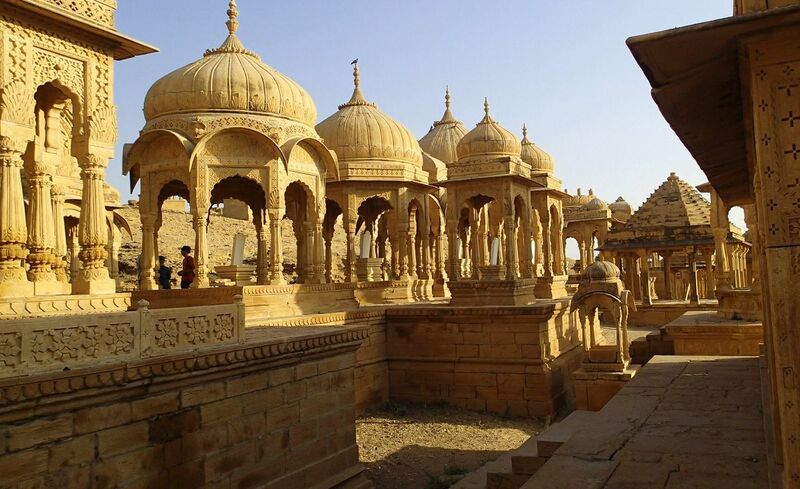 The cenotaphs here are the most fabulous structures in Jaisalmer, and one of its major tourist attractions. Dedicated to Sage Vyas, who wrote the epic poem Mahabharata, Vyas Chhatri has beautiful memorials, and is a cremation ground for Brahmins. The yellow sandstone cenotaphs are built on raised platforms, with intricately designed chhatris on top of finely chiseled pillars. They are a striking example of Rajasthani architecture. Built on a hill, you could see the Golden Fort of Jaisalmer in the distance, and fascinating sunset views. There are many cenotaphs here, so you can take your time and look around at leisure. Pay special attention to the intricate designs of chhatris (umbrella shaped domes), and delicate carvings on its pillars. Go here in early morning and evenings, as the sunrise and sunset views from here are one of the best in Jaisalmer. Vyas Chhatri is strikingly photogenic. Take your mobile phones or DSLR cameras to capture selfies, sunsets, or for landscape photography. Do you require a Tour Guide? Tour guides can give you more insight into the history behind Vyas Chhatri, so do hire a tour guide from Chetram Voyages. Per day charge is Rs.500/-, but take a Jaisalmer Tour Package from us and they come free with the package. When to visit Vyas Chhatri? Avoid summer season, as the harsh sun and heat can discourage you from visiting the cenotaphs. Winter season (October to March) is best for visiting Vyas Chhatri, and early mornings and evenings are especially good, as the sun’s rays bring out the fine details of these cenotaphs. How to reach Vyas Chhatri from your hotel? Vyas Chhatri is famous tourist spot in Jaisalmer. You can catch a tuk tuk on the streets, or a cab from your hotel to Vyas Chhatri. Where to eat near Vyas Chhatri? If you are visiting Jaisalmer, you have to include Vyas Chhatri in your itinerary!! The place is enveloped in serene calmness and tranquility. Families can come here and spend some relaxing time among these cenotaphs, and couples will find the cenotaphs enticingly romantic, as they can strike elegant poses against the backdrop of these chhatris and get their best shots. But above all, come here in the early mornings and evenings, to catch the sunrise and sunset views. They are terrific! !